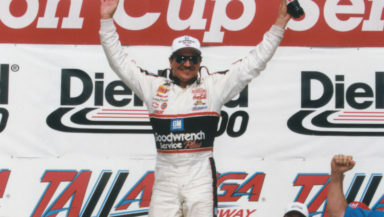 Dale Earnhardt Sr. collected three victories in the spring event at Talladega Superspeedway (all during the 1990s) and 10 overall, becoming the all-time Monster Energy NASCAR Cup Series winner at the 2.66-mile track. The tradition continues with the GEICO 500 on Sunday, April 28 as NASCAR’s biggest track celebrates its 50th anniversary this year. TALLADEGA, Ala. – When looking at the history of the spring Monster Energy NASCAR Cup Series races at Talladega Superspeedway in the 1990s, there’s one name that pretty much sums it up – Earnhardt – as in Dale Sr.
Talladega Superspeedway – which will celebrate its 50th anniversary this year – is the most competitive race track on the NASCAR schedule (record 88 lead changes in 188 laps), the highest-banked (33 degrees) and the longest (2.66 miles) as well as the most fun and fan-friendly. Talladega offers something for everyone, including hundreds of acres of free camping, amazing kids tickets and college student prices, along with special offers for military members, first responders, teachers and educators. The historic venue, which opened in 1969, is deemed NASCAR’s “Party Capital” thanks to the track’s infamous infield, the traditional Saturday Night Infield Concert on event weekends and renowned Talladega Blvd., home of the “Big One on the Blvd.” party. It’s the site of the most comfortable seats in motorsports, large ISM Vision HD video boards lining the frontstretch and numerous pre-race activities for fans on race day, including special Kids VIP opportunities. For ticket information, visit www.talladegasuperspeedway.com or call 855-518-RACE (7223). The track, along with its parent company, International Speedway Corporation, announced last year Transformation – The Talladega Superspeedway Infield Project presented by Graybar. The approximate $50 million redevelopment endeavor is part of ISC’s long-term capital allocation plan and reinvestment into its major motorsports complexes. The project, highlighted by a one-of-a-kind Talladega Garage Experience, will feature “up-close” access, interactive attractions and enhanced amenities for fans, sponsors, teams and stakeholders in the iconic Talladega infield. Full completion of the modernized project is scheduled for October 2019. Fans can learn more about the project and view the progress 24/7 via the construction cam by visiting www.talladegasuperspeedway.com/transformation.